Four Things Combination, also called Dang Gui Four Combination, is the supreme Blood tonic formulation of Chinese tonic herbalism. It is also an important Yin Essence tonic. It has been used for centuries as a moistening Blood tonic, which yields incredible results in restoring deficient Blood and Yin. In addition, it is an important blood vitalizing formulation. The treasures of the Yin Jing and Blood are promoted by Four Things Combination. Dang gui (angelica sinensis) is the primary blood tonic of chinese herbalism and is the leading herb in this formulation. Dang Gui supports healthy blood circulation and moisturizes Yin. Dang Gui has a strong regulatory effect on the menstrual cycle and supports normal uterine contractions. White peony root is the main supporting herb. It too is a major Blood tonic and is a powerful menstrual anti-cramping herb that helps promote healthy circulation, and provides herbal dietary support for women during their menstrual period. Ligusticum is warming, detoxifying and is a powerful blood vitalizing agent which promotes the flow of Qi and regulates menstrual flow, including benefiting mild cramps associated with menstruation. Steamed rehmannia is an important Yin tonic with Blood tonic qualities. Steamed Rehmannia is warm and moisturizing. 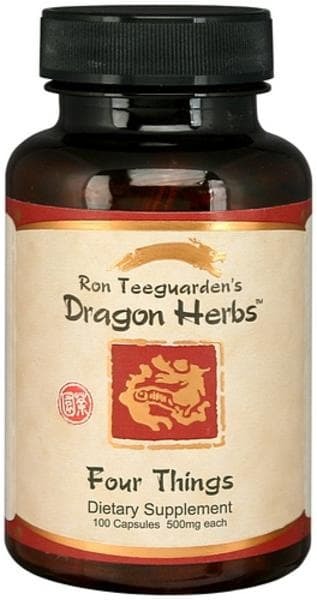 dang gui and Steamed rehmannia are herbs that are famous for replenishing the Blood and Essence. When steamed Rehmannia is combined with Dang Gui, Yin and Blood are richly nourished and the colon is moisturized, thus benefiting occasional constipation. Dang Gui, Peony, and Ligusticum are all blood movers and invigorators. Dang gui, steamed rehmmania and Ligusticum are all warming herbs. Peony is cooling to the blood, and yet it has an invigorating effect on the blood. Four Things Combination is a famous woman's blood tonic. It is moisturizing and may be used for long periods of time to restore the Yin and Blood, and improve wrinkles and other signs of aging on the skin. Four Things Combination has traditionally been used to support Blood production, to improve blood flow, to promote relaxation and energy, and to relieve mild cramps associated with menstruation. Four Things Combination may be given with Qi and Kidney warming tonics to support Blood production. Otherwise, it is quite suited to weak or strong individuals, old or young. Although women take this formula far more frequently than men, it is also an excellent Blood tonic for men, and will be found as a component in many formulations consumed by men. It is a superb tonic for all teenagers, male or female. Who can use it? Women, to help build blood, and especially to help regulate the menstrual cycle; men, to tonify Blood.